Tony Levin consistently puts out musically strong, artistically driven albums, and this one is no exception. Pieces of The Sun does differ in some ways from his previous releases, though. First, it is the first that features his touring band of Larry Fast, Jesse Gress and Jerry Marotta. Secondly, the album feels a little more straightforward, a little more rock. That is probably due to the fact that this band is used to going out and working together in a live venue. Lastly, this album is really fun. That is not to say that the previous releases were not entertaining, because they were. The thing is, they always seemed a little more highbrow, more intellectual in their entertainment. This one is really fun. It knows how to groove, but still has a great level of musical integrity. That is why this one is arguably the best and most accessible solo album Levin has given us. This review is available in book format (hardcover and paperback) in Music Street Journal: 2002 Year Book Volume 1 at lulu.com/strangesound. Coming in with a triumphant sounding guitar based segment, the track quickly shifts gear into a more erratic and darkly textured Crimsonish mode. It gets very Red era Crimsonoid at times. This one screams out until the mid section when a mellow reprieve is provided by guests California Guitar Trio. It gets a bit Yesish at times and is quite intricate. The composition eventually shifts back to the earlier semi-chaos to carry on, but eventually shifts back toward the more melodic intro to see it through. This is a killer number and a great beginning to the album. This one comes in off kilter and smoking. It really is a killer groove that works extremely well. It has definite Crimsonesque textured, but probably just about anything Levin does will. It is just plain high-energy fun. This begins in a playful, but intricate prog acoustic style. It builds gradually on this basis; the arrangement becoming more lush as it carries on. Percussion moves the track into the second movement, a more textured arrangement that has a bit of a Genesisish feel. This number was one that Levin and Marotta recorded with Peter Gabriel, but it was never released. They got Gabriel's permission to record this one. It has a definite Gabriel feel and a bit of a retro one. It is rather stripped down in texture, but makes for a great groove. This is another fun one. Described in the liner notes as "a musical experiment", the group essentially rewrote this piece. The intention was to cause a feeling of familiarity only after the chorus is revealed. Until that point the piece is meant to come across as a wholly original composition. If you ask this reviewer, the experiment was a success, and a great time. For those fortunate enough to catch Levin on the Waters of Eden tour, this one should have a ring of familiarity to it. They used the piece as their intro music on that excursion. It begins with a gradually building percussion line until the composition explodes out into the first melody line, a powerful sounding progressive rock pattern. This is a wonderful track that moves through an intriguing and dynamic procession of elements. Percussion starts this one and a "rightfully" Synergyesque keyboard sound begins the instrumental section. That makes sense since this piece was originally recorded by keyboardist Larry Fast as Synergy. The cut builds in a slow process and Levin's bass work really screams, but the cut feels a bit dated at times. Sections here and there certainly smoke, though. The percussive segment is quite cool, too. Atmospheric and mysterious sounds begin this one, and as the song proper enters it's in the form of a balladic prog style. The choruses get rather hard edged. It features an awesome break with an intriguing rhythmic texture. This is a very strong track with a lot of musical changes and a great vocal arrangement. This is simply a nice sedate jazzy number. A fairly bouncy and jazzy composition, this one is quite fun. It really screams out at times, while at other times is quite lush and atmospheric. 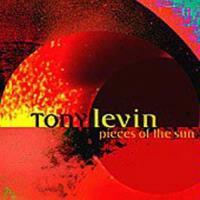 This begins in ethereal tones that call mind Levin's earlier solo works. It begins a very slow building process, but it can afford to be leisurely, as the piece is over 7 minutes in length. After playing with the opening theme for about 3 minutes, a cool bass riff takes the piece, and it is reborn into a new driving prog mode. It gets quite powerful during this movement and even a bit funky from time to time. A nearly Genesisish arrangement takes over late in the work, and the opening melody returns as the outro. Although this one gets a bit powerful at times, it is essentially a pretty and soothing number that serves as a nice conclusion to the album.